Japanese Episode AG 134: "The Orchid Laboratory! Everyone Gather!" 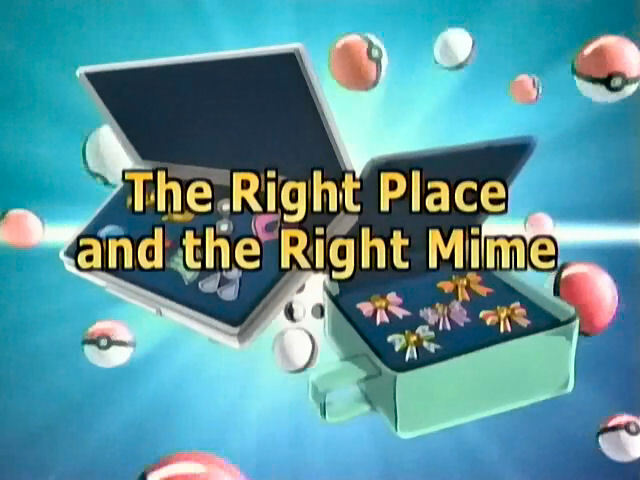 American Episode 404: "The Right Place and the Right Mime"
The morning after arriving in Masara Town, Satoshi goes to Orchid-Hakase's laboratory to visit. As Masato, Kasumi, and Kenji look after a set of Kanto starter pokemon, Haruka arrives at the lab! Satoshi tells the young Coordinator about his plans to challenge the Battle Frontier, prompting Masato to ask permission to come along. Odamaki-Hakase also informs Haruka that there are also Pokemon Contests in the Kanto Region, prompting everyone to decide to journey together! 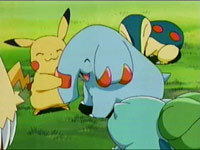 Later in the day, everyone lets their pokemon out to play in Orchid-Hakase's ranch. As the newer pokemon get acquainted with the older pokemon, the Rocket-Dan appear and attempt to kidnap all of them! 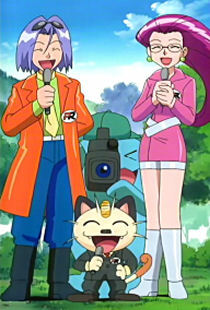 The young trainers work together to fend off the Rocket-Dan and successfully protect the pokemon from being stolen. Later, as our heroes prepare for their new journey, the Zenigame that Orchid-Hakase had been raising for new trainers decides to come along with Haruka! Haruka has obtained her first pokemon in the Kanto region! As the rest of the group shuffles their pokemon team around a bit, Orchid-Hakase gives our heroes new Pokemon Zukan filled with data about the most recently discovered pokemon. Masato's PokeNavi is also given an upgrade and tells him that the first facility is the Battle Factory, located near Hanada City. As Satoshi, Haruka, Kasumi, and Masato leave for the first battle facility, Takeshi arrives and rejoins the group! Now that everyone is back together, a new adventure in the prestigious Battle Frontier begins! The transition period between the Houen region and the Battle Frontier continues as the anime producers try to cram about an episode and a half's worth of material into 22 minutes. If the episode was divided into two parts, we'd be able to see things like Satoshi actually give us a reason for leaving Onigohri and Cotoise behind. And just randomly throwing Takeshi into the team at the tail end of the episode? Lame. One neat thing about this episode is that there's this awesome Pokemon Sunday reference in the episode. Did you click on the above link and learn what the show's about? Great. Now, when the Rocket-Dan shows up at Orchid-Hakase's laboratory dressed up as reporters, their disguises are based on three of the characters from the Pokemon Sunday show! You can click on the picture on the right to view a larger version. Musashi is dressed up as Becky who, among other things, is the VA for the Metagross trainer in the Deoxys movie and Kid Summers in the Lucario movie. Kojirou is dressed up as Red-Hakase, Nyasu is dressed up as Golgo-Sachou, and Sonansu is dressed up as the cameraman. 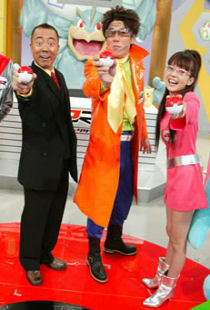 As you can see, the Rocket-Dan's outfits are identical to the ones worn by the actors in the real Pokemon Sunday show, giving Japanese fans a neat little extra that most other fans just wouldn't get. I guess Golgo-Sachou had a mustache when the episode was animated, but, as you can see, he doesn't seem to have it anymore. The dubbed version is pretty standard, and the edits are all time cuts and music edits. The only thing really worth noting is that the episode's title is one of the most mistyped titles in recent memory. A lot of people call it "The Right Place at the Right Mime" when it's actually "The Right Place and the Right Mime." Does recognizing a reference to a Japanese-only variety show and nitpicking over one word in an episode title make me a giant nerd or what? The first three seconds are removed from the episode. Two seconds are removed from the title screen. Bye bye badge case title screen! A second is cut from the shot of Orchid-Hakase's laboratory right after the above cut. The Japanese version has two vocal songs used during two different scenes that are both replaced by instrumental music in the dub. The first song is Pokettaari Monsutaari and is played from the point when Haruka releases all her pokemon so they can play with the others until her Fushigidane shakes vines with Satoshi's Fushigidane. The second song is Type: Wild and is played from the point when Odamaki-Hakase raises his Monster Ball to help the kids until the Rocket-Dan is sent blasting off. Two more seconds are removed from the TO BE CONTINUED... screen.